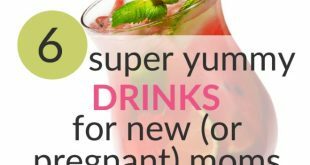 When you are 25 weeks pregnant, your baby is drinking the amniotic fluid, which is actually quite healthy and contains carbohydrates, salt, proteins and lipids for example. 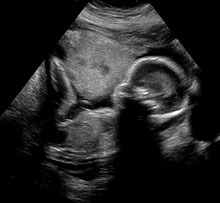 Your uterus is now the size of a soccer ball. How about your hubby, is he gaining a small baby belly as well? Learn about the most common sympathy pregnancy symptoms in men here. The fetal age of your baby is now 23 weeks and you are entering the 7th month of pregnancy. Kind of cool, don’t you think!? This is one of the busiest weeks for your baby since the spinal structures begins to form and a lot of lung developments are taking place. By this time, your baby has 33 rings, 150 joints, and 1000 ligaments. Your baby now measures about 13.5 inches (34 cm) from head to heels. The weight would be around 1.5 Pounds (680gr). The skin of your baby is now smoother than before. It is because the capillaries, which are small vessels filled with blood, are now beginning to develop under the skin. Hair growth is also taking place at this time. During the later part of the week, blood vessels are starting to develop in the lungs- that’s closer to the full maturity of the lungs. Overall, there are a lot of things going on in the lungs; work is very much in progress. Although at this time, lung surfactants, which aid in lung expansion after the birth of the baby, is already present, the lungs are still very immature to function properly like sending out oxygen to the bloodstream during inhalation and releasing carbon dioxide during exhalation. Aside from lung developments, your baby’s nostrils begin to open, though they are still plugged up with amniotic fluid. Your uterus is the size of a soccer ball. Because of your growing uterus, it can place pressure on your back as well as on your pelvis. This is the reason why you will experience periodic shooting pains in areas like your lower back and legs. If you experience this, you have to take a rest, warm bath, or you can apply a cold compress to the area. You can also try using a maternity support belt, like this one, which provides good help for some pregnant women. Common problems during this period are possible development of hemorrhoids, which are actually varicose veins. The size can be as small as a raisin or it can go as large as a grapefruit (OK, that’s not common, promise…). Fifty percent of pregnant women experience hemorrhoids to some degree. It is due to the fact that the uterus is enlarging and there is an increase of blood flow to the pelvic area, which causes the veins of the rectal walls to swell. Hemorrhoids are painful and itchy and can cause rectal bleeding. The best way to deal with them is to prevent constipation. Constipation can actually worsen the case. So you have to increase fiber in the diet and increase your fluid intake. If you do get hemorrhoids, a home remedy is to apply a cold compress to the affected area for more than one time in a day. This is done to aid in decreasing the swelling and discomfort. Soaking in warm water or having a hot sitz bath can also do the trick. If these won’t help at all, refer to your health care provider for some medical alternatives. Aside from hemorrhoids, you may also experience activity intolerance. This is because of the many changes in your circulatory system such as an increase in blood volume and increase in cardiac workload. So whenever you feel tired and dizzy, you should take a lot of rest. It is time to start thinking about attending a prenatal birthing class. You can do it where you live or online (or both). 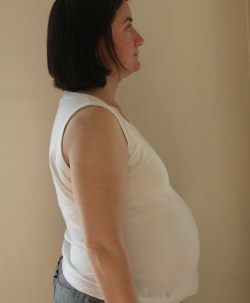 For high-quality online prenatal class, check my review here of a class that I have followed. I am not sick anymore, but very tired. I’m thinking about starting to work part-time. My iron levels are down even more, to HB 99. 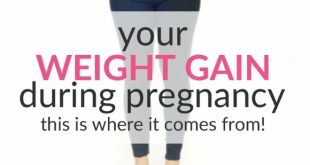 Are you also 25 weeks pregnant? Please share your experiences and thoughts by leaving a comment below!